This is a beautifully illustrated collection of some of the most inspiring messages from #1 "New York Times" bestselling author Joel Osteen's "Your Best Life Now". Since the publication of "Your Best Life Now", millions of people have been discovering what it means to live happy, successful, fulfilled lives. In his book, Joel Osteen reassured us that living life to our fullest potential is within our reach. His seven step plan taught us how to make the most of our lives by realizing how a healthy self-image and a vision for the future are just some of the keys to unlocking our potential. Now, Joel offers a book of Scriptures and meditations based on his seven steps that allow readers to truly focus on the primary themes of "Your Best Life Now". 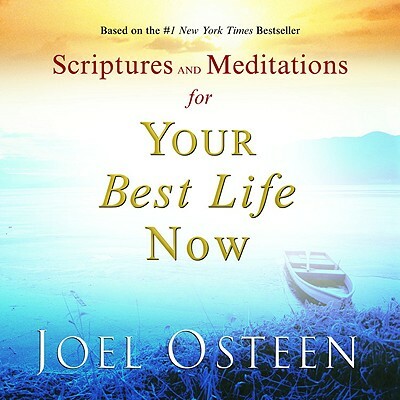 Scriptures and Meditations for Your Best Life Now by Joel Osteen was published by Time Warner Trade Publishing in November 2006 and is our 34928th best seller. The ISBN for Scriptures and Meditations for Your Best Life Now is 9780446580656. Be the first to review Scriptures and Meditations for Your Best Life Now! Got a question? No problem! Just click here to ask us about Scriptures and Meditations for Your Best Life Now.